SPECIALIZING IN RAWLING'S BASEBALL AND SOFTBALL EQUIPMENT. FULL DYE SUBLIMATED UNIFORMS. USE OUR UNIFORM BUILDER TO DESIGN. JUST SAVE YOUR RETRIEVAL CODE TO SEND TO US FOR PRICING. JERSEY’S AS 20% OFF , AS LOW AS $28.00. 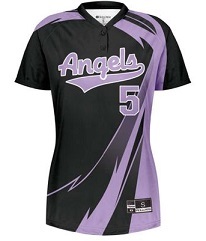 WE ALSO OFFER CUSTOM T-SHIRTS AND UNIFORMS ALONG WITH TEAM DECALS AND TEAM BANNERS. VIEW OUR WEBSITE TO VIEW UNIFORMS AND EQUIPMENT CATALOGS AND CALL FOR PRICE. OUR STORE HOURS ARE TUESDAY THROUGH THURSDAY 12PM TO 5PM, AND SATURDAY 9AM TILL 12PM.